Stuart Henson enjoys Richie McCaffery’s conversational and sharp-witted poetry – and his knack of crafting a good punch-line. as if we might come in useful. of grief, flickering with disbelief. or it fails me, it still passes. we always seemed to break things. That familial debt is nicely paid too in ‘Left hand drive’ where the poet experiences the shock of seeing his father’s car parked on a street in Belgium (‘Not his exactly, but the same / colour, model and year’). It takes him back to the times when his father picked him up from school ‘and its bullies’ and the simple clause ‘The car was empty’ echoes his desire to see his father living again with genuine emotional resonance. The ending, which I won’t give away here, clicks perfectly into place with a blend of wit and sorrow that’s something of a McCaffery trade-mark. ‘Kongostraat’ and ‘Left hand drive’ are among four outstanding poems from Passport that appeared in the Magma ‘Europe’ issue earlier this year, and there’s little doubt where McCaffery stands on the great divisive issue of our relationship with what was once known as ‘the Continent’. McCaffery’s own struggle is much more to do with resolving the divisions within himself. The delightfully playful ‘Ish’ squeezes every nuance from the popular qualifier. A student in Scotland who grew up in Northumberland, he feels more Scottish than English. my nationality grows on a grapevine. The rhythms here are typically conversational. The penultimate stanza is really there to set up the punch-line. But there’s something in that ‘By instinct or experience’ that lifts it momentarily out of the anecdotal into something altogether more troubling. Why is it we always seem to try the locked door first? Is it some kind of inherent human perversity? And the things we trust in – instinct, experience – are they reliable guides after all? 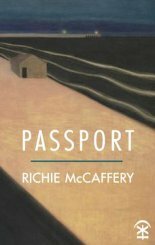 That said, Passport remains a hugely entertaining and engaging second volume from a poet whose heart is generous and whose wits are sharp.